Star Rating for this page previously was 4.36 Stars out of 5 ( total 78 votes ) using different Star Rating Tool. The star rating is completely removed as you should use g+1 (google) which is below the title above. 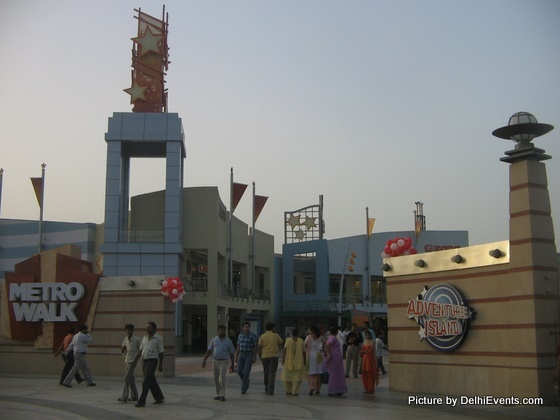 Metro Walk Mall & Adventure Island : The Rohini Amusement Park is sprawled over 62 acres in North West Delhi. The project encompasses a shopping mall - Metrowalk and Adventure Island, a world class amusement park and a water park. It is the result of 50% partnership between Unitech and International Amusement Ltd., the promoters of Appu Ghar. People are coming from South Delhi & Gurgaon too even though it's located in West Delhi & Near North Delhi. Parking : Very Spacious overground parking. The retail environmentat Metro Walk is spread across 2.21 lakh sq.ft and is anchored to the park. This retail development has both a fun / amusement / impulse driven retail mix as well as convenience shopping options for an extended catchment area. It overlooks a large lake which acts as the separator between the mall building and the park. It also has a small area ( 3.5 acres) dedicated to POGO branding. There are total 78 retail shops including eating joints. You will find many of the major brands here. The amusement park contains about 26 rides and attractions. All the rides here are imported from the suppliers who supply to international amusement parks like Disneyworld, Universal and Six Flags. The water park offers many rides there. Rides & Adventure Island is too much costly, middle level family can't afford this amount. Worst Place. No Value for money. Park is not in shape to operate at present. Management should wait for another 2-3 months before starting it. One-third of the rides mentioned at ticket counter are not yet operational, another one-third will be under maintenance/cleaning. If you want to waste your weekend and disappoint your kids, this is the place you should visit. Park management is concerned about selling tickets only. Staff is untrained and rude. Inside the park there are two small shops for food/snacks and price of food items are 3 times of the market price. i dont think so its such a bad plac but nor its too good ok, b'cause the staff is really untrained but not rude, only if u do something wrong like sitting in a ride for too much of time and others dont get chance only or anythin else. the main part i hate in there is that the ticket is costly but its not a timewatse its just a fun plzace for rides and i love it (not too much). This place is too expensive the rates should be lowed a bit..... other wise no one would like to visit it ..... n should also be open on Saturdays n Sundays so people can enjoy their holidays. i m also convinced with faiz ......that adventure island is more than its worth costly . Hey this place is really rocking and worth 350 bucks..
if u like adventure and ready to spend a whole day its teh best place to be..
bt i thnk rain dance rox man. Is this park any good for 4 1/2 year old. I'm planning to take my son for a weekday. I am getting conflicting views. Let us not comment on the cost of the ticket only. Adventure Island (AI) is a decent park to be indian. the rides have been bought from Europe. they are safe. lack of a good rollercoaster is there. i think this park is headed for disaster at some point when the screws get loosened as the rides get older. i hope the staff is trained to fix and check the rides regularly. the water rides were not active yesterday in january 21st. the lake boats were not active...id give the park a 5/10 stars. its worth the money cuz its only 220 if you are a student and under 17.
it's a lovely place. Go ahead! And Japanese park is different. That's all i could say. i think the place is awesome....but a little expensive. First of all let us know who suggeted to open up an amusement park wid such highest rates n lowest quality overall. Moreover the crowd is such-- noone atleast me n my known to's will not even think to visit here again.If u really wanna make it a success,, work on price rate & staff training, security check in ride's ques. Its foolish to compare it with Florida. Of course, little costly form mediokar family.. point of view which are most common visitors n kids, needs improvements. anyway good outing for whole day. da only -ve point is dat its vry costly.......otherwise its ok.
getting into the park requires an admission fee but r da rides free of cost once you have entered? people should be allowed to take their eatables inside,as it is quite costly inside. hi im pranjal i vist advanture island last week and it is worstless and too costly place.i m not satisfied with the services provided by there staff. I believe it is only a matter of different point of view, for me, it was a great experience, specially the rides and the food is also great don't think abt money if you seek quality. do you think that much before purchasing a costly jeans or shirt? MR ANKUR or mr illiterate it is adventure and not advanture** and 'their' shud be used instead of 'there'. and u looser indians can't afford RS 300??????. u know how much disneyland and movie world cost???? above RS 5000 u freaking people!!!! I visited recently with my son on a saturday and was in the park for 8 hours. my initial reaction was that its a complete waste of money. but as the time progressed we discoverd the rides and we both liked them. My son who is 6 years old got on to 12 rides (multiple times)and he loved all of them. couple of rides are excellent for adults and are at par with international standards and worth hopping on. I felt that it was a tad expensive but its a good strategy as only few people come in and you get to be on the rides. any cheaper and it will be super crowded and no one will be able to enjoy. it was a good crowd 95% of the people that day were decent. The employees were professional and i would like to take my kid again next year when they add on 5-6 more rides. IT IS TRULEY AMAZING AS ITS COST IS NOT SO HIGH & IT IS AWESOME AMUSEMENT PARK SPECIALLY FOR THE INDIANS. FOR ME IT NEITHER BAD NOR GOOD IT IS SO BORING FOR THE DEVELOPED COUNTRIES LIKE AMERICA BUT FOR THE INDIANS IT IS BRILLIANT AS THEY ARE POOR AND CAN AFFORD 350 BUCKS FOR THEMSELVES. IT SHOULD HAVE MANY WATER RIDES,DISCO ETC & SOME AWESOME RESTAURANTS NOT LIKE McDONALD,PIZZA HUT ETC. wow! what a brilliant place i wish to go there atleast every weakend. went yestrday there wd fns .. had a few passes... so it only cost us 170 per head.. and v realy enjoyd.. rides wer gud.. staf ws quite gud and so ws the weathr ystrday. all in all,,, it ws fun.. I am planning to go to adventure island and i think the basic drawback is that the cost is 300 for weekend and for weekdays they are charging 375 without any added benefit. But still for going over there first time i am exicted!!!!!!!!!!!!!!!!!!!!!! It is an excellent place to spend the whole day there and worth spending 350 bucks. Food is costly in some of the outlets, so please see the rates before placing the order. Overall you will enjoy a lot there and would like to come there again.. have a bet! As an expat, I find it acceptable, however on the last visit, 4 of the main rides were out of order. This of course affects your value for money. Would suggest that the management ensure that maintenance works are done during the week and not to have the park main rides out of order on their busiest periods! Food is poor and so are hygiene /cleaning levels. Ok for the kids for a day out however. I don't want to comment on Adventure Island but the people who are commenting rudely for Indians should be locked in that round ride and be left there till they learn a good lesson. I want to go there but I am little bit Confused after reading the above comments........... I can't understand shall I go or not. my GF want 2 go thr but i hav no enough money now to spend in such a place.so pls give comment me eithr shall i go or not?? Hey i think people have different views , but to be frank , if you really want to enjoy then dont think of money. If money is your concern then have peanuts and sit at home. Adventure island is a place where you can go once and enjoy not to keep one hand in your pocket. some body tell me IS IT WORTHY TO MAKE A DATE THERE.........................................????? Rs. 375..any ride also OR it is just an entry fee? its a nice place to freak out..
but a little costly, njoyment can b increased by decreasng sum amount..
guys if you look to have fun with your honey,its a great place to go.the fun u will have with your gf is most precious moment that you would have ever seen.if you need a silent place it has park with seats available to sit.in short money doesnt matter,if you get so much out of metro walk and adventure island. water park has not started yet and the cost for ticket is only for the rides..
Are all the rides free once you bought the tickets? Is it safe for girls - you know how Delhi boys, men are. Wet girls in water parks and uncivilized Delhi men can end in a nightmare, so is there good security? how is the experience there?? The place is rocking with nice atmosphere and new hip hop rides for all the agegroups, but rates should slash down a bit in order to gain more attraction from all classes of people. i m just want to say that its Rocking place yar..! I just visited on 05 Aprail 09 with my friend and i really enjoy this weekend. Can anyone plz tell me that 350 is just the entry fees or does it includes the rides charges also.Is water park open??? i liked when i visited it with my school . i and my lot of friends went there . we went there in nearly October 2008 .
but i liked it . the ticket fer all the rides fer kids blw 17yrs is rs250 and fer adults it is 400rs. it is inclusive of all the rides any no. of times. Have the prices increased from Rs 350 to Rs 400 ? Are there any other hidden charges as well. Or u just end up spending Rs 400 per person? Is it a nice place for people around 45-50 years? The place is really awesome. Within a year I had been here 3 times with family and friends. I agree that the price is a bit high but once you spend and you would enjoy it like anyhitng. please tell me if there are any water rides? i am planning to visit adv. island with my brother - will any one tell me how mush is the cost per person !! Can someone please confirm the ticket prices and whether this one is the prices for blanket rides or this one is just the entry ticket to the adventure island? Pathy place.not maintained at all. rides are good but their maintainence and staff is pathy. i think... metro walk.. is a nice hangout place for youth... yaa.. its tru.. that it is costly.. an individual has to think 3 to 4 times before making a purchase..
and.. regarding adventure islnd.. yaa its a borring place.. entry fee is too much.. .
any one pls Please let me know...what is included in Rs. 375..any ride also OR it is just an entry fee? Please someone tell that when water rides n water park would start????? n Wht does it IncLudEs....onLy EntrY or SomE RidEs alSo?????? AlSo temmE z there Any WaTer Park There????? Very Very expensive ! Very costly. Rs. 400 means Rs. 1200 for a small family of four. Rs 1200 is about 5 to 10 % of a middle class family person income. If prices get low, Islnad can earn a lot. It is such a bad place.I have been to Adventure island last week. its a nice place all those who said that its a bad place are totally mad .cost is high because the rides are awesome. the charges of the rides are very expensive. we cannot afford it. it is not at all like disneyland. its too much costly if we want to go only in water park or want to play only a ride its much costly. and we cant go with our family becz if we are 5 memebers rs 2000 is very high without any fooding and all. will anyone tell.....what is d cost of adv. insland from monday to friday.............????? tum logon ko aur koi kaam nahi hai kya ??? After spending so much money per person (Rs. 400), it is better to go to water park and that one does not repent later. hey guys!! what is the price.. is 400 rupees only the entry fee and do they charge seperately for each ride??? Is the cost includes the rides also or only the entry fee is Rs 400/- Pls Confirm. ya i think they all are rite when i went there it ws like i wasted money its damn costly . Anyone tell me...is there any water rides or not?? adventure island is really pathetic!! i want to celbrate my birthday with my girlfrind...on sunday.i lisnt about that there is good place for fun & love with girlfrind,this would right place to visit with boy & girl....? plz sugest me.....? whats the ticket amount of adult in weekdays n weekends ??? it shud b little less ..
bhai kaisa hai sahi sahi batao..
Aaj mai Adventure island jaa raha hu. Wahan se lautkar apna experience share karunga..
hi , i've been to adv island a lot of times and have enjoyed each time i went . it's a wonderful place with a lot of amazing rides . you also must go . hey i jused wanted to know that 350 is d price for the rides also or just an entry fee!!!!!! wen i went last tym ...i had fun ...!! all slide were workin properly ...!! is this place a really good one i am confused bcoz i am getting mixed comments here.so guys its like that our school is planning to take us to this place.so should i go?pls help me. it is good place to visit. people enjoy there too much . there are soo good rides to visit . every thing is maintained . hi i think ticket is much expensive. i want to go there but how? Hi its Jai,If you read the comments, definetly it will confuse U, As there is mixed view about the experience,What I will say "Ek bar try karne mein kya jata hai"
Hi all it's me harinder. metrowalk is good for hang out. After appu ghar it is the best place for enjoyment. It's true that it is costly.I think i go metro walk 20 or 30 time i never get boated there nd take a ride 7 or 9 times. It's good for enjoyment. hey, r th rides scary or what?? boring, or normal..suitable 4 kids? what about older?? As everyone said, and i also realised dat the fair is much costly, and most of the rides was not working properly, so they were out of service. It can be good if the fair should be less as 250 for all. Good cafetaria with resonable price of food. ya its true dat da fee is xpensive as said by all. defintely one gonna enjoy after spending such amount of money. Also itney comments aye hain logon ke, matlab jagah toh glamrous hai... jana toh parega hiiii..... "So let's rock"
hey i jused wanted to know that 400 is d price for the rides also or just an entry fee!!!!!! guyz i think dat all of u who say dat d ryds rnt wrking r outdated losers... ur talkin abt d one off day... or mayb just copying frm oders commentz! adventure island is an AWESOME plae nd if u wanna enjoy den itz d way 2 go! Its a great place and adventure island is more than its worth costly.its an awesome place to be and you would enjoy a lot there. We Are planning to visit this park...Please suggest!!! may i know how it's cost to enter the place???? its a good place for outing with family,friends and for picnics.ITs a costly palce but not too much.its a full use of money nd time not waste of money nd time.so,everybody use to visit there for a once for an outing. It is very good Place. I Enjoyed Very much. Ya it is right That it is too costltly but it is enjoyable Place. yes tickets r so coslty but its a very nice place.. u shud go and check out d rides..
place is nice..but jana h wahan to sirf frnds k sath othere wise aap bour ho jaogey wahan...bc every thing is very costly there..u cant enjoy..agar dost sath hotey h to fun hota h..or fun k liy metro walk is the best place..specially scary villa...hum sab frnds ne milkar itna enjoy kiya usdin wo b dar-2 k us scary villa main only in 100 rs ticket..jo aj b nahi bhul sakte..14 jan it was the our best day in metro walk.. It's not as costly deal. Rs 350 for full day fun. on my first marriage anniversary last year, we went there and played tambola outside the park that i think used to be there on every weekend. my wife and me both won the first and second house prices and won the adventure island tickets for free. and after that we paid just 200 rs as tax amount on free tickets and visit the park. the management was worst inside the park. 30-40 peoples were stuck in the middle of the ride because of some break down in the ride. in first visit u cant even find out the ways for all the rides.. its totally confusing. in totality...it was not even worthy to go there after spending 200 rs for two persons.